Batteries that power common devices of modern life, from computers and smartphones to electrically driven cars, are often made of toxic materials, like lithium, that are not easy to dispose of and have a limited global supply. However, researchers at the Massachusetts Institute of Technology (MIT) have developed a new system to generate electricity, which utilizes heat instead of toxic materials or metals. This new technique is based on a 2010 discovery by Michael Strano, the Carbon P. Dubbs Professor in Chemical Engineering at MIT, and his co-workers. 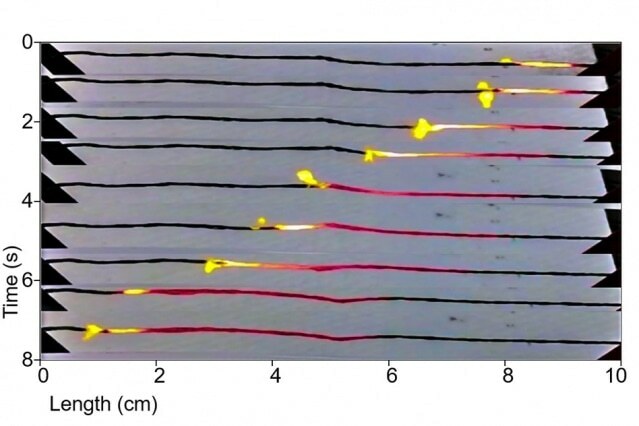 They demonstrated that a wire made out of tiny carbon cylinders or carbon nanotubes can generate electricity when it is heated slowly, beginning from one end to the other. The heating is achieved by using a combustible material to coat the wire, and igniting the one end of the wire so that it burns like a fuse. This was an unknown phenomenon then, but the experiment produced only a small quantity of electric current in the laboratory setting. The process efficiency has now been increased over 1,000 times by Strano and his group, so that the new device can output as much power as that produced by the best batteries in existence today. However according to the researchers, a commercialized product is still several years away. The results were published as a paper by Strano and doctoral students Sayalee Mahajan PhD ’15 and Albert Liu, and five others in Energy & Environmental Science. It’s actually remarkable that this [phenomenon] hasn’t been studied before. His team’s work has focused on improving the process efficiency, as well as “developing the theory of how these things work.” According Strano, the experiments demonstrate a good concurrence between theoretical and experimental results, confirming the underlying mechanism. The effect is a result of a heat pulse that pushes the electrons through the carbon nanotubes, taking the electrons with it, similar to a group of surfers riding a wave. One vital finding that validated the theory is that on some occasions the heat wave generates a single voltage, but in other instances it generates two varying voltage locations at the same time. “Our mathematical model can describe why that occurs,” Strano says, unlike the alternative theories. According to Strano’s team theory, the heat wave “divides into two different components,” which on some occasions reinforce one another and at other occasions counter each other. In their latest model, the team reports that the device’s efficiency is more than 1 percent for converting heat to electricity — which is “orders of magnitude more efficient than what’s been reported before.” The energy efficiency is approximately 10,000 times more than that what was reported in the first discovery paper. This new technology took just about one-fifth of that development phase. Added to this, while lithium is highly flammable if exposed to the open air, the fuel of the new device is safer besides being renewable. The earlier experiments involved the use of potentially explosive materials to generate the heat pulse to drive the reaction, the new research uses a rather safe fuel: sucrose (table sugar), though other combustion materials may generate even higher efficiencies. In contrast to other technologies being specific to a certain chemical formulation, the new system using carbon nanotubes works on heat, so that when better heat sources are formed they can be swapped into a system to improve its performance. The device has demonstrated that it is powerful enough to power electronic devices such as an LED light. Compared to batteries, which can gradually lose power during long periods of storage, the new system has a potentially infinite shelf life, Liu says. So it is suitable to be used as a deep-space probe, which remains dormant for several years while traveling to a far-away planet, and then requires a quick bout of energy to send back data after reaching its destination. [This work is] an important demonstration of increasing the energy and lifetime of thermopower wave-based systems. I believe that we are still far from the upper limit that the thermopower wave devices can potentially reach. However, this step makes the technology more attractive for real applications. [With the help of this technology] we can obtain phenomenal bursts of power, which is not possible from batteries. For instance, the thermopower wave systems can be used for powering long-distance transmission units in micro- and nano-telecommunication hubs. Kourosh Kalantar-Zadeh, a professor of electrical and computer engineering at RMIT University in Australia, who was not involved in this work. The team also included Anton Cottrill, Yuichiro Kunai, David Bender, Javier Castillo Jr., and Stephen Gibbs. The research work received support from the Air Force Office of Scientific Research and the Office of Naval Research.